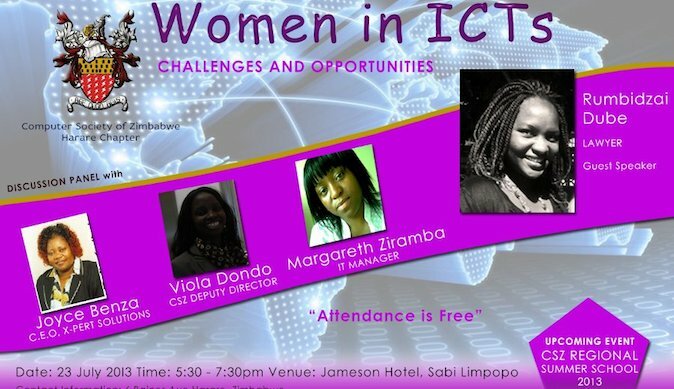 The Computer Society of Zimbabwe will on Tuesday host a discussion panel on Women in information communication technology sector (ICTs). The discussion will be facilitated by some of the leading women in the ICT sector in Zimbabwe who include Joyce Benza, Managing consultant of X-Pert Solutions, Viola Dondo, the CSZ Deputy director, Maragerth Ziramba an ICT Manager with the Premier Service Medical Aid Society and Rumbidzai Dube a savvy ICT advocate who is also a lawyer by profession. Panel Discussion will be held at Jameson Hotel,and will focus on challenges being faced by women in making a breakthrough in the male dominated sector. Considering that facilitators are ladies it shows that the ICT field is for everyone and much can be done from every angle. Opportunities will also be discussed in relation to how the girl child can be better prepared for a career in ICT Leadership, Sofware and Network Engineering, and the many facets of ICT. World over we have Marissa Mayer as one of the best leaders of Yahoo and Carly Fiorina, a former C.E.O of the global computer brand HP. That said it means there is no limit to who can make or break it in the ICT sector even locally. A run-down of popular blogs and online platforms, you will not miss such a great project as Herzimbabwe.co.zw being led by a versatile trained journalist Fungai Machirori. According CSZ "the space is for everyone and it is believed with this Discussion Panel a lot will come out and a path will be set for more involvement by women in the Zimbabwe ICT sector." The event comes at a time the society is undergoing transformation with a possibility of rebranding to ensure that it operates professionally while achieving its set targets and objectives that include ensuring the ICT person remains relevant.